Browning, Robert. Poems of Robert Browning containing Dramatic Lyrics, Dramatic Romances, Men and Women, Dramas, Pauline, Paracelsus, Christmas-Eve and Easter-Day, Sordello and Dramatis Personae. London: Henry Frowde, Oxford University Press, 1907. viii, 696 pages; frontispiece (engraved portrait); 19 cm. Unknown number of trade copies published in London under the Henry Frowde* imprint of the Oxford University Press. While the tightly printed double column text remained the same, the bindings and finishes varied to appeal to a wide range of consumer tastes and budgets. At the highest end of the scale was a full leather deluxe binding by the W.H. Smith Bindery. 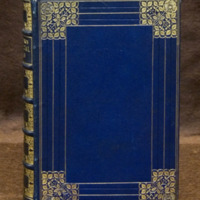 From 1905 to 1914 Douglas Cockerell managed the Smith Bindery and designed all the special bindings. 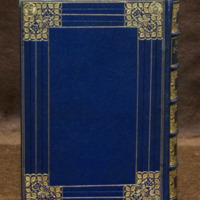 Fully bound in dark blue morocco leather, the front and back covers of this volume are outlined in double gilt fillets. The elegant corner designs on the front and back covers include gilt leaves, gouges, and dots, which surround a single gilt flower ornament tucked in the angle. Two blind and evenly spaced gilt fillets connect the corner pieces creating rectangular panels along the borders of the front and back covers. The five raised bands on the spine creates six compartments. The second compartment from the top is outlined in gilt and in gilded, uppercase lettering is the text “R. 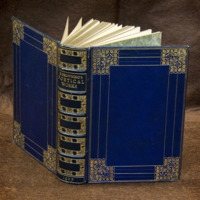 BROWNING’S POETICAL WORKS.” The five remaining compartments are adorned with the gilt leaves and dot design framed by gilt borders, and in gilded lettering below the gilt leaves design in the bottommost compartment is the publication date, “1907.” The leather turn-ins are elaborately tooled with gilt leaves, stems, and dots with the flower tool used on the covers’ outer corners. 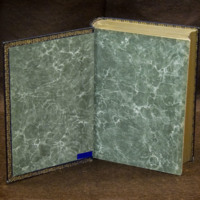 The endpapers in the front and back inside covers feature green-grey marbled inks, and an oval blind-stamp on the lower left side of the back inside cover features the initials “WHS.” A small printed label with “The Knole Guild (Misses Speall)” is located on the lower right corner of the inside front cover, with the text block in gilt on all three edges. The elaborated composed and skillfully executed floral corner pieces are in sharp contrast to the empty centre panels on the covers. The end effect is deceptively simple and balanced.